If you want to enjoy most of the benefits derived from honey. The purity of honey is what you should consider before buying. Do you know there are two types of honey, Fake and Real Pure? You should know what is Fake Honey and what is Real Honey? Well, just by seeing the honey, we can’t say whether it is real or fake. Without knowing how to check the purity of honey, it will be difficult to tell and identify the difference. Without distinguishing the difference between pure and fake honey, you will end up buying bad products. There are a lot of adulteration of honey, which makes it not real yet sold as the real thing. Before carrying out any of tests, one basic and extremely simple “how to check the purity of honey” method is to read the label on the jar of honey, prior to its purchase. Manufacturers are required to mention the additives and additional substances that have been added to the produced honey. So you can make out if it is organic or extra sweet or artificial flavourings have been added, simply by scrutinizing the label. So, here’s a tutorial about what is pure honey and how to test the purity of honey. What is 100% Real, Pure Honey? The most common references to real and pure honey are organic and natural honey. As you would expect, real honey should not come from a factory but from bees. Pure honey is the natural product made by honey bees. Organic honey is made by the bees that were fed only with organically grown flowers. You will need tests to distinguish between the real and fake honey. 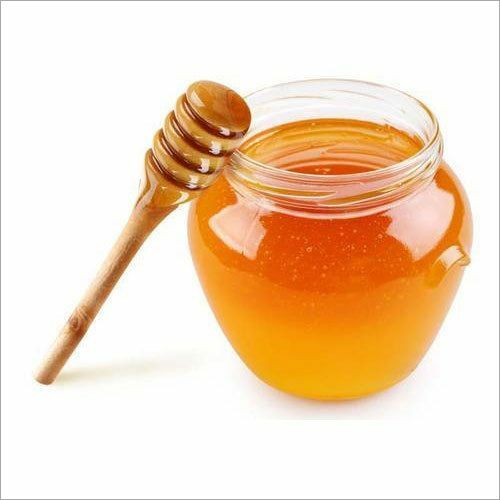 Also referred to as impure, artificial or adulterated, fake honey is ‘honey’ that has been added glucose, dextrose, molasses, sugar syrup, invert sugar, flour, corn syrup, starch, or any other similar product, other than floral nectar. How can you Identify Real and Fake Honey? The purity of honey can be checked in the labs whether it is pure or not. But, as we are looking for a simple way by which an average day to day consumer can quickly tell if it is fake or pure/real honey. The first and probably the most obvious step, for anyone who is concerned, is to check the label. The label contains some information that might be helpful. Below are some of the main differences in properties that will help you distinguish between the real and fake honey. 11 Differences to Identify 100% Real (Pure) and Fake Honey? Pure Honey: It is Fairly thick and takes the time to move from one side of the jar to the other. Fake Honey: Not dense at all. Fake honey is very light and runny. Pure Honey: It tends not to be sticky if rubbed between fingers. Fake Honey: It is fairly sticky because of the high percentage of added sweeteners and additives. Pure Honey: The taste vanishes in a matter of minutes. If you heat and cool pure honey, you will alter the taste and kill all healing and nutritional values. Fake Honey: Taste will remain for a little longer because of added sugars and sweeteners. Pure Honey: If experienced, you can actually smell aromas Mild scent, probably the actual smell of the flowers from which the nectar was collected. Fake Honey: There is mostly none or just industrial sour smell. Pure Honey: If you heat the pure honey, it caramelizes quickly and does not make foam. Fake Honey: Never caramelizes and forms the foam and becomes bubbly because of the added moisture, sugars and water. Pure Honey: Doesn’t get dissolved in water, but will lump and settle at the bottom. Gets diluted when stirred for a while. Mixing in equal amounts of honey and methylated spirits, honey settles at the bottom. Fake Honey: Stays incoherent and gets dissolved water right away. Dissolves in methylated spirits while making the solution milky. Pure Honey: If we immerse a matchstick in the honey, it lights easily with no hesitations. 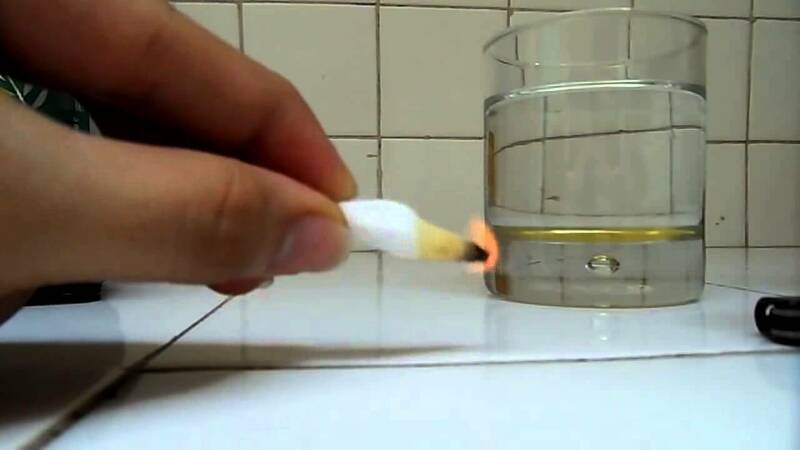 Fake Honey: Matchstick does not light easily due to the presence of moisture. 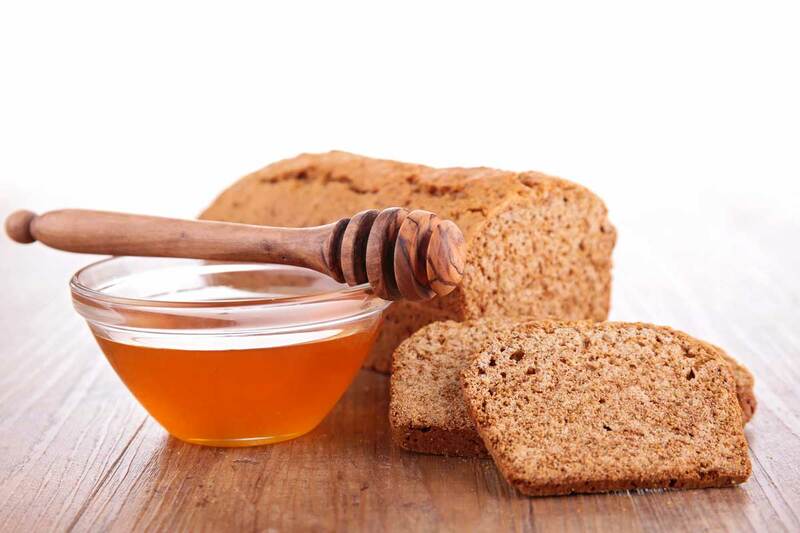 Pure Honey: When spreading on a slice of bread, the slice hardens within few minutes. Fake Honey: It gets the bread wet due to moisture content. Pure Honey: Few drops poured on blotting paper do not get absorbed. When poured on a piece of white cloth, it won’t leave stains. Fake Honey: Gets absorbed into blotting paper. Leaves stains on a white piece of cloth. Pure Honey: Presence of impurities: dirty-looking particles, pollen and bee body parties. Fake Honey: Absence of impurities. Pure Honey: When poured into a container with yolk alone and the mixture stirred together the yolk appears like it is cooked. Fake Honey: Has no effect on the yolk. There are quite a number of methods you can use to determine or know if honey is fake or pure. 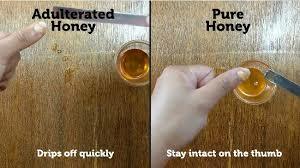 Put a small drop of the honey you have on your thumb. Check to see if it spills or spreads around. If it does, it is not pure. Pure honey will stay intact on your thumb. Add one tablespoon of honey into the glass. Adulterated or artificial honey will dissolve in water and you will see it around the glass. Pure honey, on the other hand, will settle right at the bottom of your glass. Organic honey is flammable. Here’s a test to know 100% pure organic honey. Take a dry matchstick and dip its tip right into the honey. Strike the stick on the matchbox as if to light it. If the honey is pure, the matchstick will light with ease. The flame will also keep burning off the honey. However, if it is with impurities, it will not light because fake honey contains moisture as one of the impurities. These are some of the simple and common ways to test pure honey at home. If you know any other tips that we didn’t mention here, let us know in the comments section below. Which honey do you use? Real or fake?